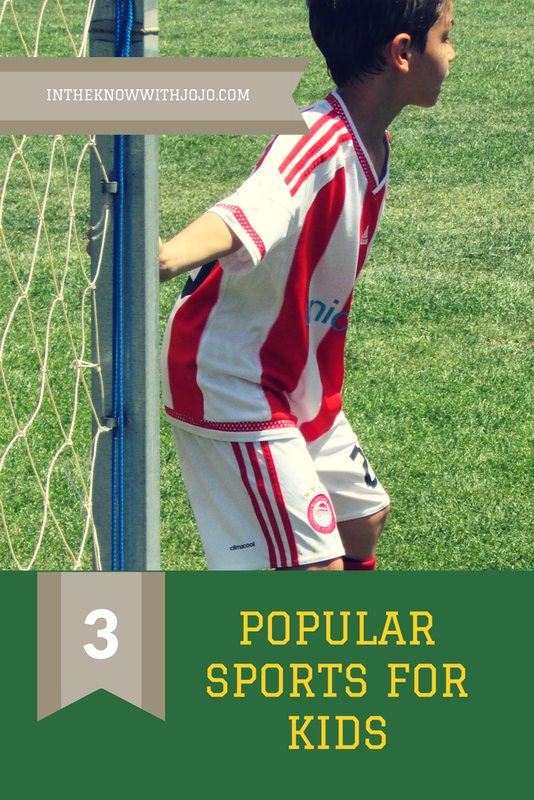 Do you really want to put a smile on someone's face this year? Then get them the perfect gift from Shabby Chic Soap Company! There are a lot of talented vendors out there who make beautiful items but very few and far in between do you find a true artist! Shabby Chic Soap Company's products are true works of art; every piece is so beautiful and thoughtful. 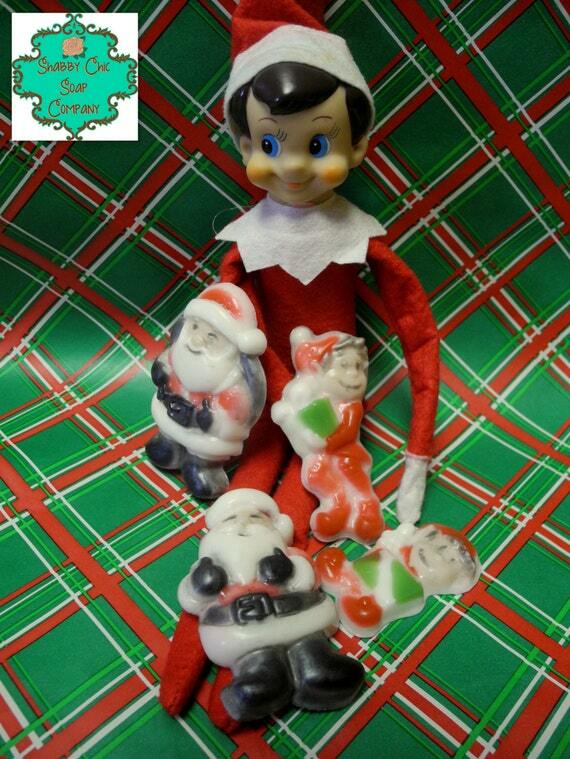 Shabby Chic Soap Company has the perfect gift for everyone on your list even the guys! We were able to try a large selection of Shabby Chic Soap Company products and loved every one! Some of my favorites for kids were the Soapy Bath Crayons. The color in the Soapy Bath Crayons was very bright and wrote really well for the kid in the tub! They really loved their bath crayons. Let the little ones doodle all over the tub and tile with these cuties, then you can easily wash it away with a warm, wet washcloth! Just like their soaps, these crayons contain no detergents, so they are gentle on their hands. Sold in sets of the 4 primary colors shown. Next we loved the Lumps Of Coal Soap Bars. They had a hint of glitter making them sparkle just like coal. Mom put one of these back to use as a stocking stuffer. Gavin loved these!Lumps of Coal soap bars. Have someone on the naughty list? 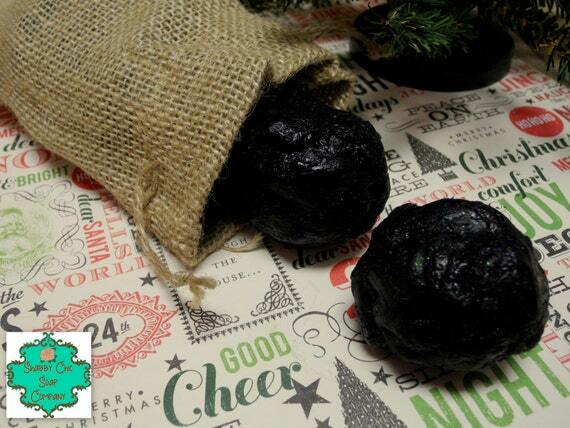 Fill their stocking with these fun Lumps of Coal bars! Sold in sets of four 2 oz soaps, these bars are decked out with activated charcoal (helps to clear out pores and refine skin) and a bit of "diamond dust" glitter. Can be done in any scent, but we love them in Santa's Spruce or Woodland Elves! Includes a burlap bag for storage and easy gifting! 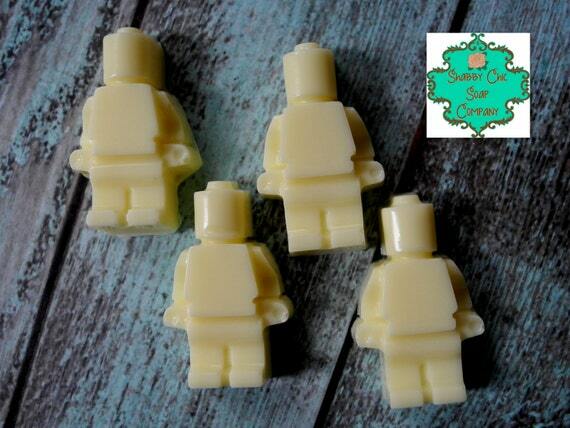 Christian favorite items we tried were of course the Lego Inspired Soaps and The Lego Men Inspired Soaps! 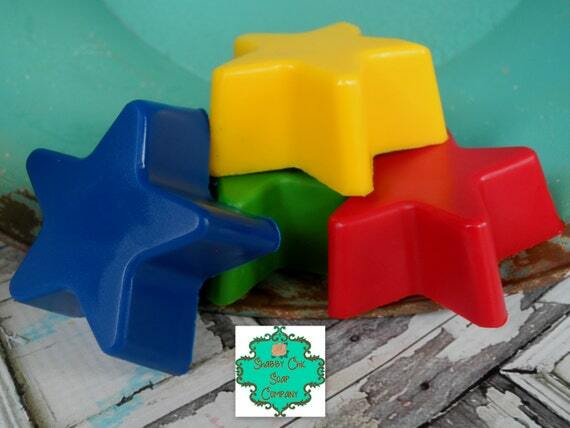 Lego pieces weigh about 1 oz each and can be done in any color and scent combo. 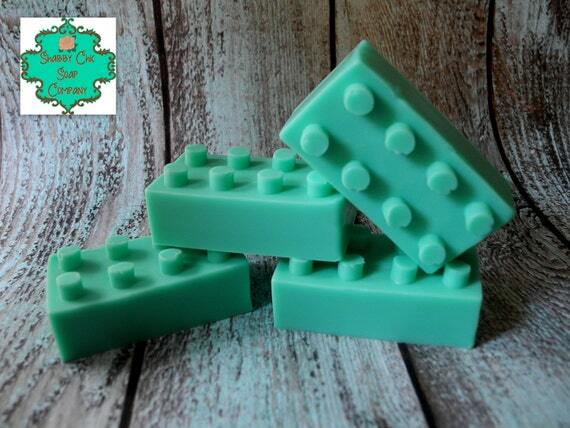 They are a great way to get your Lego fan excited about bath time! Sold in sets of 4. Lego Men weigh in about about 1/4 oz each. The perfect size for a single use. Can be done in any color and scent. I saved the best for last my absolute 2 favorites for the kids were the Gift Box Soap Bars and Christmas Magic Gift Set! Gift Box Soap Bars are fun 5 oz Shea Butter soaps not only do they look like little gift boxes...they actually have a surprise toy embedded inside!!!! The boys got cars in theirs! Can be done in any scent. 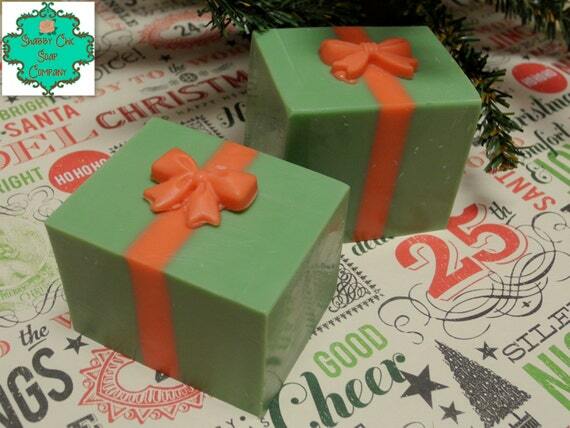 The Christmas Magic soap set is the perfect way to spread some holiday cheer this Christmas season or use to as a prop in your Elf on the Shelf's daily adventures! The set includes 4 Shea Butter soaps and you get to choose your scent and character combination. You can get 4 of the 0.5 oz elves, 4 of the 1 oz Santas or 2 of each all packaged in a cute Elf on the Shelf bag (while bag supplies last). We love these in our holiday scents like Santa's Spruce or Fresh Snow, but especially in our exclusive Elf Farts! These were so cute and the colors were so intricate! Now for the adults! I loved this Snowflake Soap Bar! 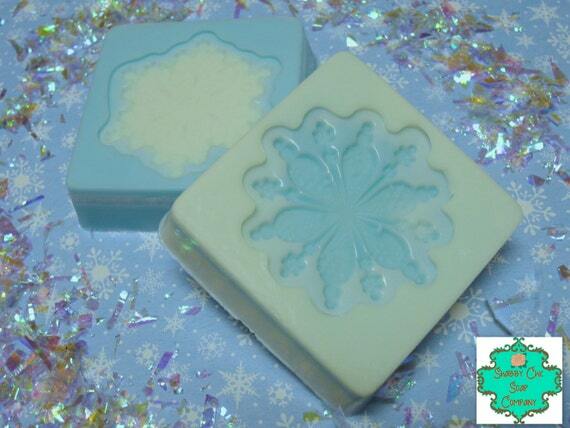 These 4 oz Shea Butter soaps are decorated with intricate snowflake designs, making them perfect for both Frozen fans and winter time! Can be done in any scent, but we love these in Fresh Snow. Fresh Snow scent is to die for! The Sugar Cubes we tried were the perfect exfoliators. They really buff and brush away all that winter dead skin and the scent is so nice! These single use sugar cubes contain Shea Butter and Sweet Almond oil and come packaged in a mason jar for easy storage. Take one with you in the shower and scrub your cares away while cleaning and caring for your skin. If you have a color preference, please let them know when you place your order. If no color preference is given, they will use a color which coordinates with the chosen scent. you more than gentle skin! 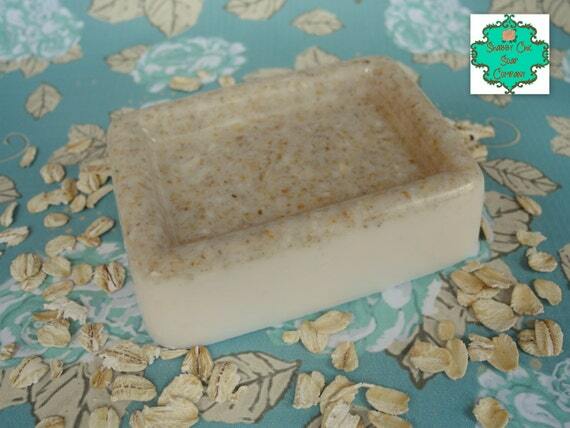 Oatmeal can do amazing things for your skin, so adding it to a Shea Butter and Coconut Oil base just makes this 4 oz exfoliating soap all the more luxurious! 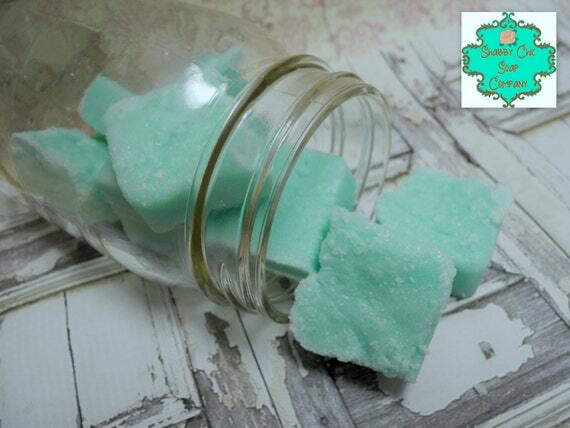 Can be made in any scent or go unscented for the perfect soap for sensitive skin. The snowflake was beautiful. So intricate and matches the sugar cubes. The perfect accent for a winter bathroom. I think the Peppermint Pinwheels would be great for Christmas! The Ninja Turtles would really go over well with my nephews! I liked the Luna Soap Bar. My Husbans would like the His and Hers Soap. My son would like the TMNT Soap. and my daughters woulf like the Rainbow Popsicle Soap. They were all awesome. We enjoyed looking at them all.